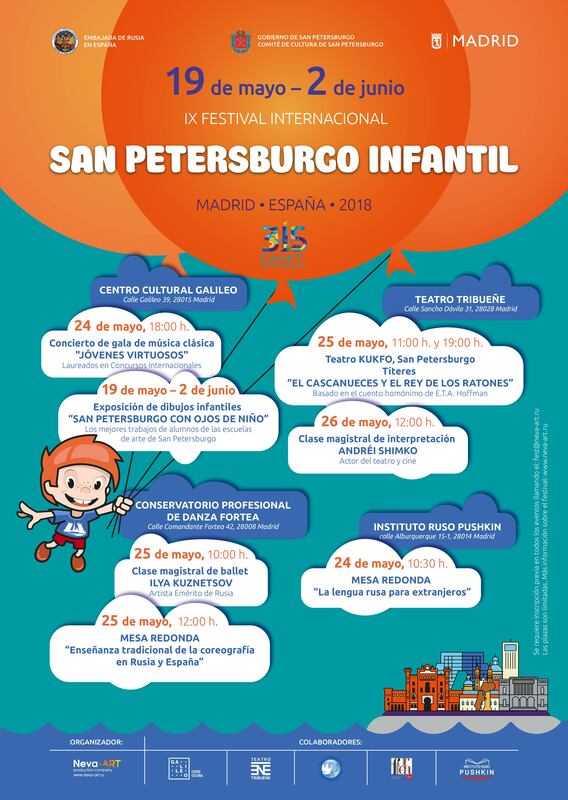 From 19 May to 2 June, 2018 International annual project of the Government of St. Petersburg the 9th International Festival «Children’s Petersburg» will be held in Madrid, the capital of Spain. A diverse program of the Festival including music, art, drama and educational events, will give the viewer a unique opportunity to go through the creative achievements of the collectives of the Northern capital. Exhibition of children's drawings "Petersburg through the child’s view." The best works of students aged 5.5 to 16 years of St. Petersburg art schools were selected by experienced art critics. The drawings, made in different styles, genres and techniques, combined "reasoning" about the native city and life in it: landscapes and city sketches, still lives and illustrations, quiet streets and courtyards, city squares, gardens and parks, city roofs and bridges, cozy houses and masterpieces of architecture, cathedrals and temples. Round table Conference "Russian language for foreigners". (Albuquerque Street 15-1, 28010 Madrid). The official opening of the Festival is the gala concert of classical music "Young virtuosos". It will open the public an authoritative Russian performing school, presenting its most talented young musicians. Laureates and Diploma winners of all-Russian and international competitions, students of the most prestigious musical educational institutions of St. Petersburg under the age of 18 will perform works of Russian and foreign classics. Ilya Kuznetsov, Honored Artist of Russia, Merited Artist of the Republic of North Ossetia-Alania, laureate of the Higher Theater Award of St. Petersburg "Golden Sofit", the founder and artistic director of the network of dance schools "Ilya Kuznetsov Children's School of Ballet" will hold a workship of ballet art. It will be devoted to the basic principles of studying the basics of classical dance, the program will include: the basic elements of the exercise at the machine and in the middle of the class, the technique of learning dance options and sketches. Venue: Professional Dance School "Fortea"
(Comandante Fortea str., 42, 28008 Madrid). "The Nutcracker and the Mouse King" is a performance based on the fairy tale of the same name by E.T.A. Hoffmann will be shown by the St. Petersburg Theater "KUKFO" (Puppet Format) - the author's theater with a European chamber atmosphere, created by the director and artist Anna Viktorova. "The Nutcracker and the Mouse King" is a fairy tale about Queen Myschild and her mouse army, about the bewitched young Nutcracker and how courage helps him to regain the human face, about the girl Marie to her kindness and sympathetic heart. This story is about adventures and miracles that happen only on the eve of Christmas. (Sancho Davila 31, 28028 Madrid). The Round table Conference "Traditional choreographic education in Russia and Spain" will be aimed at a dialogue between Spanish and Russian specialists on modern approaches in the system of choreography training with the aim of popularizing and further disseminating the most effective methods and forms in the choreographic education of both countries. The workshop on acting skills by Andrei Shimko, actor of theater and cinema, one of the brightest and authoritative teachers of the Russian State Institute of Performing Arts, the department of theatrical art "The School of Russian Drama of I. Gorbachev", creator and artistic director of the Naive Theater, laureate of the Tsarskoye Selo Arts Award, the Russian National Theater Award "Golden Mask" and the Higher Theater Award of St. Petersburg "Golden Sofit". The international festival "Children's Petersburg" will become a bright event of the cultural life of the capital of Spain and will show the importance of children's creativity and creativity oriented to the young audience, proving the relevance and interest in this field of art.